Until the great mass of the people shall be filled with the sense of responsibility for each other's welfare, social justice can never be attained.” This quote from Helen Keller captures the soul of a human rights framework. Our hearts must be stirred with not only compassion, but with a feeling of obligation towards our fellow human beings before we can rally for positive social change. Thus the first step in addressing a particular human rights violation is to consider the human landscape of pain, loss, and injustice--to be touched and moved by the emotional devastation that we see before us before we can tackle the crimes and restore just practices. As the first chapter in my case study of Argentina’s dirty war, I offer you some context for the historical scene of this human rights violation under study: forced disappearances. Yet, first and foremost, I desire to demonstrate to you the impact these “disappeared” people left as a moving legacy for this generation and for generations to come. Through images, testimonies, poetry, and song, a voice is lifted across the world for the hurting and violated people of Argentina. Between the years of 1976 and 1983 a military dictatorship known as the Process of National Reorganization instituted a hellish regime of oppression and torture upon the citizens of the land and therefore became infamously labeled the “dirty war in Argentina.” Semitism, persecution, censorship, terrorism name just a handful of the crimes that took place during that time. Although all these actions caused irrevocable damage, one violation stands out as particularly devastating because of its magnitude and deep level of pain that was inflicted upon the people. It is called “Operation Condor” --the enforced disappearance of persons, more honestly termed “the death of political dissidents (Argentina country reports,"2002).” According to Silvia Nagy Zekmi, these individuals “were heavily drugged and then thrown alive out of airplanes far out over the Atlantic Ocean, leaving no trace of their passing. Without any dead bodies, the government could could easily deny that they had been killed.” They just simply disappeared. This phrase was recognized by Argentinian de facto President, General Videla, who said in a press conference during the military government which he commanded in Argentina: "They are neither dead nor alive, they disappeared". It is thought that in Argentina, between 1976 and 1983, up to 30,000 people (9,000 verified named cases, according to the official report by the CONADEP were subjected to forced disappearances. The reporting of these numbers is a vague estimate at best for it is based upon public testimonies of relatives and friends. The regime during its reign carefully destroyed all documentation and so voluntary reporting is our only means of accurately assessing this situation. However, regardless of the exact calculations, the number is reprehensibly large and worthy of our thorough investigation. We all may shudder with horror and disgust as we hear this degree of atrocity leveled against humanity, yet upon what basis do we judge this case? We must stand upon the law, the universal standard that many individuals agree upon. The Rome Statue which establishes the International Criminal Court declares that enforced disappearance are a “crime against humanity.” These disappearances violate many of our basic human rights including the “right to liberty, the right to personal security and humane treatment, the right to fair trial, legal counsel, and equal protection under the law, and the right of presumption of innocence.” We cannot forget the families and friends as well who endure much hardship in relation to this crime against humanity. In pursuit of justice, the International Convention for the Protection of All Persons from Enforced Disappearance, adopted by the UN General Assembly on 20 December 2006, also states that the “widespread or systematic practice of enforced disappearances constitutes a crime against humanity.” It therefore offers victims’ families the right to seek reparations, and to demand the truth about the disappearance of their loved ones. As we investigate this case, we must bear in mind that this human rights violation is universally declared as a “crime against humanity,” and is therefore truly a cause worth fighting for. 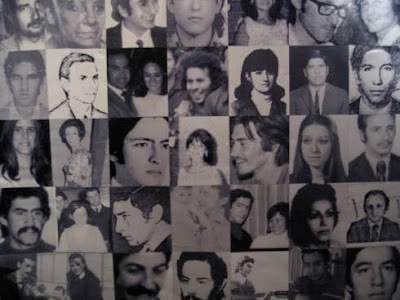 A website called “Project Disappeared” has performed the heroic task of collecting over 1300 photos of the disappeared individuals and posting them on the “wall of memory.” As the few photos below here depict, these people were both young and old, male and female, and their images are etched forever upon the minds of those who loved them. For those who do not recognize a beloved one among the photos, they can take a moment and reflect upon these faces of real human beings whose lives were snatched away all too soon and all too sudden. By connecting with these images, we can feel the pain that weighs upon those who were left behind and out of true and deep sympathy seek out ways to mitigate the evil that was exercised upon these innocent individuals. Every time I try to go back to the period 1974-1977, a silent anguish rushing to my throat. I look around me: my children, street trees, the clear air of the summer ... I think they are not, who took their children to the hypothetical street trees that would live in the cool of all summers ... They stayed in 24, 25 or 26 years, eternally young. I feel guilty. I do not think I did my best to make things different. I think I made many mistakes. I think I was a coward. Poetry is a song from the heart that pours forth when we are filled with deep emotion and feeling. In times of tragedy and loss, affected individuals oftentimes put their pen to paper and let the ink speak the unutterable words of sorrow and grief. Tenerife, a victim of the dirty war, found such solace and became a renown poet because of his passion and desire to remember those who disappeared, but left their mark upon the souls of many. “Few know that I am a poet, few know that in the beginning we were a group of poetillas, so young, we draw in the air of our own destiny. I still remember our first joint recital at the hall of a university in southern Argentina. We were five or six. I do not remember exactly. Of those now there are only two. The rest was in that horrible mass murder they did to our generation. They did not say a peep. against the light of our eyes. And he went up to the attics fear. with its share of fire, salt and water. Stay tuned for further investigations and reports brought to you by Ava Munson, University of Washington.